Happy 4th of July Astoria! Hope everyone has a fun day planned, either at home or if you're spending it away. In case you're hanging around the nabe, I wanted to provide you with a quick, little food game-plan. Brunch - There are lots of restaurants in the nabe featuring a special 4th of July brunch including the Queens Kickshaw, Ovelia, El Ay Si and others. 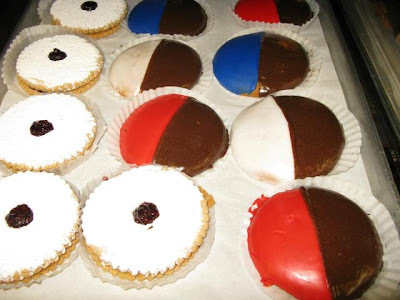 The Bohemian Hall & Beer Garden will have special Karaoke night tomorrow starting at 7 p.m.
Dessert - While you may find some bakeries observing the holiday, others such as the Astor Bake Shop and La Guli are open and serving up some patriotic treats. Just have a look at La Guli's pretty red, white and blue cookies and cakes. Something homemade - If you're spending the 4th at home or at a friend's house, consider making something homemade and special. A few recommendations that have gone over well for me are this chocolate peanut butter ice box cake, these chocolate chunk with a hint of sea salt cookies, and perhaps some messy (but still very delicious) brownie ice cream sandwiches.